The dog days (or should I say “cat-days”?) of summer are here and it’s HOT out there! Today I’m sharing 5 tips to help you protect your cats from the summer heat. We have two cats, Rocky and Callie. Rocky is 6 years old and is an indoor-only cat. Callie, on the other hand, is 19 years old and has always been an indoor/outdoor barn cat. We “re-homed” her with us when my parents moved from their country property to the city of Houston a few years ago. When I say indoor-outdoor, I mean Callie (and her sister, who is no longer with us) stayed outdoors every day but would be called in (with wet cat food, lol) and put into the barn or garage every night. Callie had a couple of spots on the porch or in the garage (we left it partially open for her during the day) where we could always find her snoozing. In the evening, she would come to the kitchen window and let US know she was ready for her dinner! Now that we’ve moved into our temporary rental home, we’ve had to change Callie’s routines up a bit. We don’t have any tree cover here and the garage gets direct afternoon sunlight, so it gets really hot out there. Because of this, Callie doesn’t stay outside as much. 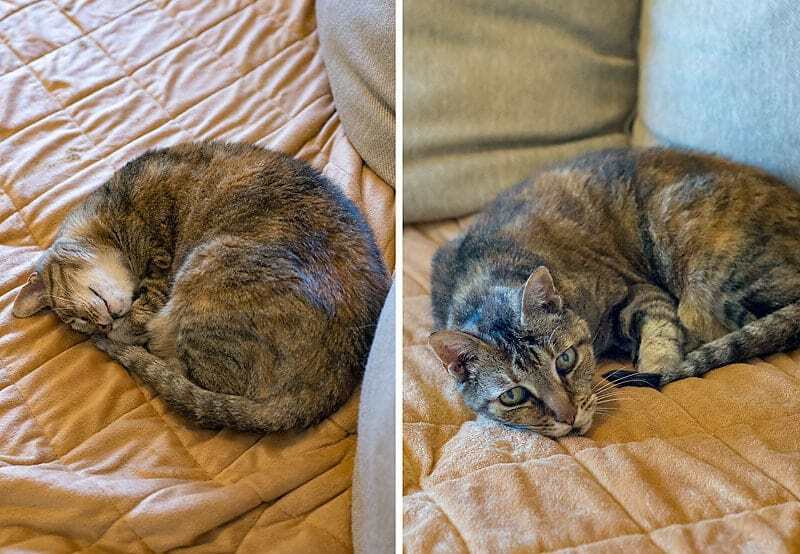 She spends the mornings on the back porch, but now spends a lot more time in the afternoons sleeping on our upstairs couch! Believe it or not, cats do sweat. They sweat primarily through their paws, which have the most sweat glands, and is why you may see damp paw prints in the summertime. This is a definite sign your cat needs to cool down! 1.) Bring any indoor/outdoor cats inside. To help protect cats from the summer heat, it’s a good idea to bring any indoor/outdoor cats inside during the hottest part of the day. With or without air conditioning, inside your house is likely to be cooler than any spot they’ll be able to find outside. During the hottest periods of summer, try to let them outside at night when it’s cooler and bring them inside during the warm weather. We do this with one of our kitties. What temperature is too hot for cats? A cat’s normal body temperature ranges between 99.5 and 102.5 degrees. 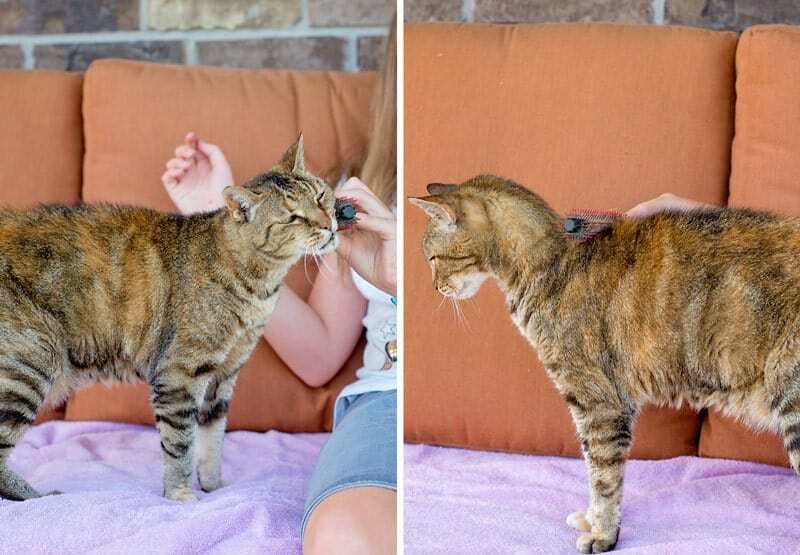 You should become concerned about how to cool down a cat when their temperature reaches 104 degrees, which is considered the beginning of heatstroke. A temperature of 106 degrees is considered extremely high. 2.) Make sure they have flea and tick medication. Giving your cat flea and tick medication is important year-round. However, it’s important to mention as a warm weather safety tip for cats as summer is when ticks are most abundant. We use Catego® for Cats to help protect our kitties. Catego® for Cats is a powerful flea and tick control. Applied monthly, Catego® is a topical treatment that will protect your cat from harmful parasites like fleas and ticks! It’s also easy to apply with the patented applicator) and kills fleas within 6 hours. 3.) Let them relax in the coolest areas of the house. Your cats will naturally seek out the most comfortable areas of the house, such as tile floors not in the direct sunlight or in front of a fan. If they have an area they usually hang out, try to keep that area cooler by closing the curtains to avoid sunlight if possible. 4.) Add ice to their water. A simple way to cool down a cat is to add just a couple of ice cubes to their water dish, especially if you’ll be gone most of the day. 5.) Reserve playtime for nighttime. Though this is not the most fun warm weather safety tip for cats, it is important. Running around and playing makes a cat warmer, just as it would a human. Let them conserve their energy during the day and save playtime for after the sun goes down. 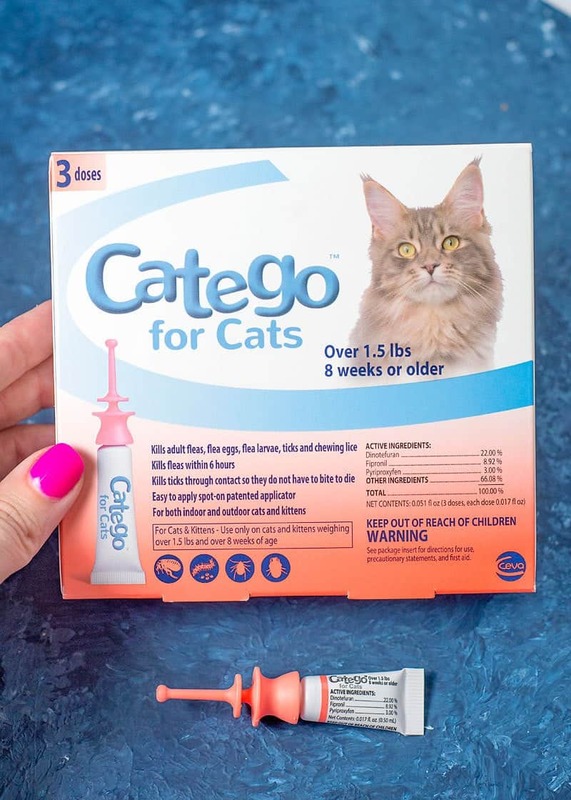 Don’t forget find Catego® at locations near you. Now it’s your turn! 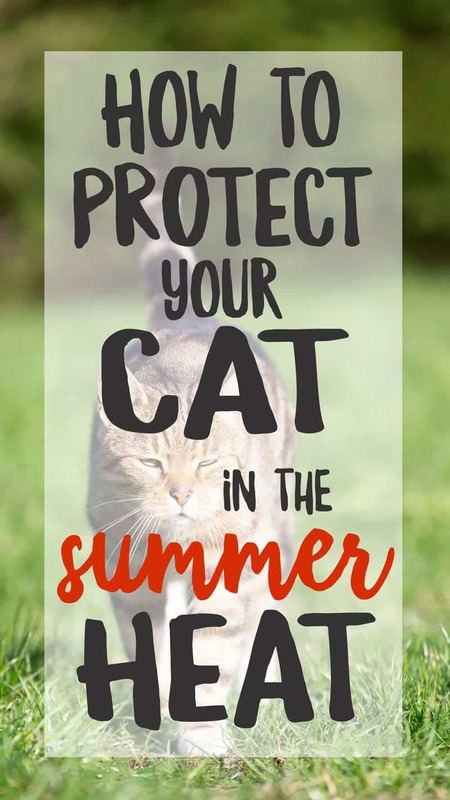 Do you have any tips to share for protecting your cats from the summer heat? My dad has a cat so I will for sure send him this. I am sure he will appreciate it! It’s so important to remember the well-being of our furry friends in the summer! They need plenty of tlc in this heat. It’s been really hot here too. we always make sure our pets have extra water and a cool place to rest during the day. Thanks for these tips. Pet parents must exert extra effort in monitoring our fur babies for signs of dehydration to prevent heat stroke. I always have a bowl of fresh water (with ice cubes) for my cats and dogs so they can drink up and keep a stable internal body temperature. We always think about keeping dogs cool in the heat, but not always cats. That’s a great tip to place an ice cube in their water dish! What a beautiful cat. Sounds like she is well-cared for. It is so hot here in the summer that cats are best to stay indoors. 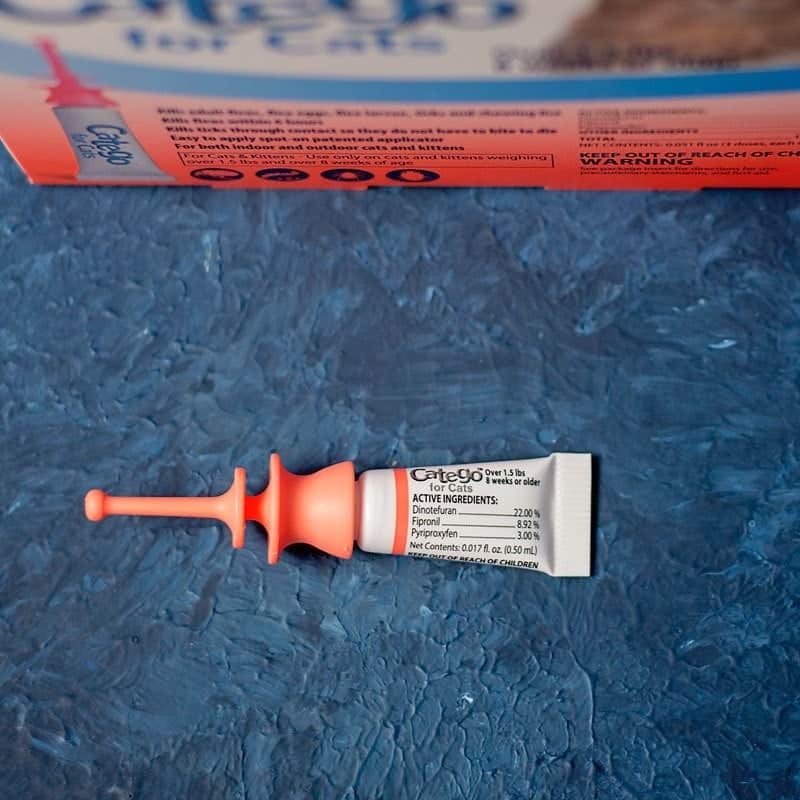 Flea and Tick medication is also so important for our pets.